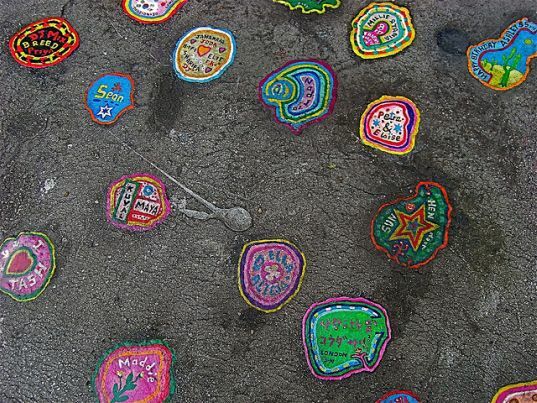 Mr. Wilson has been featured on BBC and a variety of other British media outlets for his meticulous works on chewing gum. Once he’s set his sights on a sidewalk, he doesn’t pass up a potential canvas, painting on every flattened blob for hours on end. While we’re featuring all but a sampling of his work here, a proper Flickr gallery can be viewed here, where one can find strawberries, cityscapes, tributes, memorials, commissioned ads and confessions of love – some signed by the artist and some lost in swirls and details. And while this may make you want to leave your gum for him on the sidewalk, don’t jump the gun – Wilson already has plenty to work with, so let’s not go making more blotches, eh? There's a fine line here somewhere. Let's not confuse something like OCD with art. 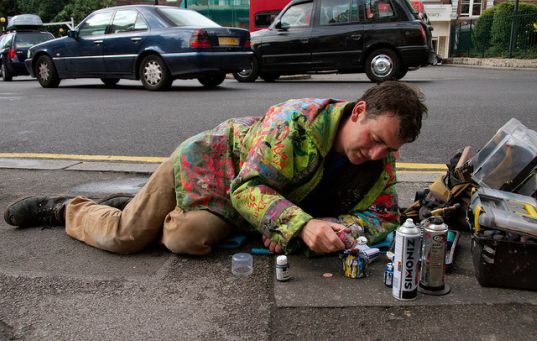 This is Ben Wilson hard at work on the streets of London. Ben signs most of his works with his initials when there's room. Wilson typically paints whatever seems to grab him that moment. But since receiving a fair amount of media coverage, he's been commissioned to do personal commercial works as well. He typically uses acrylic paints and very tiny brushes in his process, and to ensure that his works aren't disturbed Wilson fishes each gum splotch with a blowtorch and some lacquer. Despite the simplicity of some of the images, each piece takes hours to complete, sometimes even requiring a full day's work. Wilson estimates that he has painted between 8,000-10,000 of these mini-masterpieces.